The Beagle Shepherd is the offspring of a Beagle and a German Shepherd. Since both parents are purebred, the Beagle Shepherd is regarded as a designer breed. This attractive canine will be of medium size. His coat will be dense and maybe short to medium in length and the shedding amount will be medium to upper-medium. Described as energetic, highly intelligent, loyal and faithful, the Beagle Shepherd is one of the best guard dog you can find out there. The dog can also be a nice companion, so if you are an active person, then the Beagle Shepherd is one of your best choice. The term “Beagle” is believed to have been derived from the old French word “becquele”, meaning “noisy person” or “open throat”. This term might have been used to describe the breed’s loud baying. Baying is like a loud howling, which alerts the hunter that his pack has located the prey. In dog language, it is the scent hound’s way to say “over here” and the hunter can then track down the target by following the beying. The original Beagle was a small-sized dog. Beagles were imported into the USA in the 1860s and got accepted by the American Kennel Club in 1885. As of 2017, the Beagles were among ten most popular breeds, according to the Kennel Club’s ranking. On the other hand, the German Shepherd originated in Germany in the 1800’s and was initially bred as a herding dog. They were protective and vigilant over the flock. The German Shepherds would not only bring back a lost sheep but also fight off predators in order to protect the flock. The German Shepherd has been growing in popularity throughout Europe since the beginning of 20th century. During World War I and II, more or less than 80,000 German Shepherds were recruited by the German army. In 1993, they became the third popular breed in the States. Today, you can see German Shepherds used for police work, military work, search-and-rescue, watchdogs, narcotic detection, therapy dogs and also guide dogs. The Beagle Shepherd will be the combination of his/her parents. Most Beagle Shepherds have drop ears that are not so floppy. They are medium sized dogs. Their coat is dense and may be short to medium in length. Inheriting the physical traits from the German Shepherd parent, the offspring can be muscular and sturdy, It has almond shaped dark eyes that are alert and full of expressions. His/her muzzle will be medium to long with a black nose. Normally the dog would have a long tail. The dog’s appealing face gives the impression of a trusted friend. The coat of these designer dogs can be in 4 variants: black, white silver and red. You should also take notice of grooming your dog’s coat, since it is likely to be dense and straight. German Shepherds are large dogs, with males ranging from 24 to 26 inches in height and from 65 to 90 pounds in weight. Likewise, the Beagles are much smaller. They can be from 13 to 15 inches high and weigh between 20 and 30 pounds. The offspring of these two purebred dogs can be anywhere in between the two parent breeds. A Beagle Shepherd cross will usually fall close to the middle, with makes between 16 and 24 inches tall and 22 and 56 pounds. Female Beagle Shepherds range from 15 to 22 inches in height and 22 to 49 pounds in weight. The Beagle German Shepherd mix temperament can be expected to be like that of the Beagle or the German Shepherd parent, or a mix of the two. Your pup are likely to be confident, intelligent, alert, curious, patient with children and wary of strangers. Other than that, the Beagle Shepherds mix traits can vary widely, since the two parents do not seem to share too many things in common in terms of personality. The German Shepherd tends to be determined and obedient. They other protective of their family and territory. Whereas, the Beagles are rather friendly, affectionate and excitable. Their offspring can possess any of these traits. 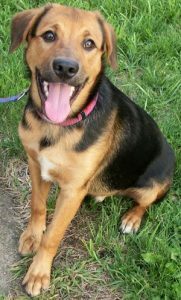 The Beagle German Shepherd mix normally has a life expectancy of between 10 and 14 years. Both the German Shepherds and Beagles are prone to hip dysplasia, degenerative myelopathy and epilepsy, so these health issues are the sole concerns of anyone who is trying to adopt a Beagle German Shepherd mix. According to the Orthopedic Foundation for Animals, around twenty percent of both the parent breeds are under the effect of hip dysplasia, so there is still a chance that your Beagle Shepherd can go down with hip dysplasia. The other health issues are not as popular as hip dysplasia, but you still need to pay attention to those. Ask the breeder for the information of the parents in order to check for their health issues records. Also ask them to conduct some tests for a double check. Keep in mind that preparing is always better than curing, so don’t skip any of those procedures. The Beagle Shepherd is active and requires plenty of exercise. He or she needs at least an hour of exercise each day and should be walked for a total of 12 miles every week. Just like many other active breeds, if the dog is not provided with proper training and exercising, it is likely that they will suffer from mental, physical and behavioural problems. It may also have the Beagle’s need for companionship, in which case a constant human or canine companion is also necessary to avoid the issues. You should never allow your Beagle Shepherd to be off leash outside unless in a properly fenced area since its strong scent drive may cause you a lot of trouble. Looking at the bright side, the Beagle Shepherd loves his/her family and is eager to learn and please. You should also provide your dog with early exposure to strangers to prevent misbehaving later in its life. There are not much to discuss about this great designer dog. Being the offspring of two of the most popular breeds in the world, the Beagle German Shepherd inherits many good appearance traits and virtues from their parents. If you are seeking loyalty, friendliness, protectiveness and care, the Beagle Shepherd would not let you down. Provide the dog with all its needs and your time with it would be unforgettable.